In February, the SPCA of Texas Rescue Investigators received a call about a dog dying of possible starvation. The team immediately responded, but what they discovered at the scene was worse than imagined. The Rescue team followed the sound of clanking chains to the raised wooden porch of a trailer home. A section of the porch had been cut out, and there, trapped beneath the porch in the mud and filth, they found the dog. Phoenix was confined to a short, thick chain - similar to one that would tow a vehicle. There was apparent, significant scar tissue, along with massive burns, running down his shoulders & back. Due to the horrific condition he was found in, our investigators obtained a seizure warrant and removed Phoenix from the property. He climbed right into our crate - as if he knew we were there to save him. Phoenix was looked over by our veterinarian upon arrival & is now resting comfortably in the care of the SPCA of Texas. The five-year-old Pit Bull mix has warm blankets, toys, food, clean water, medical care, human kindness for the first time in who knows how long. He receives hydrotherapy baths several times each day, which has helped his back immensely. Despite his pain, his tail wags and there is hope in his eyes. He knows his life is changing, but faces a long road ahead. 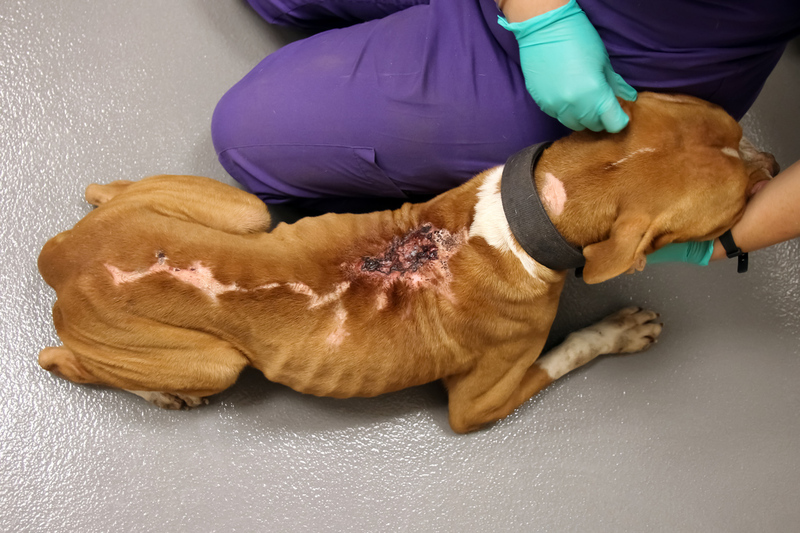 Your gift today will help Phoenix, and others like him who desperately need the loving care and rehabilitation that the SPCA of Texas provides. The SPCA of Texas (Society for the Prevention of Cruelty to Animals of Texas) is the leading animal welfare agency in North Texas with two shelters and three spay/neuter clinics located in Dallas and McKinney, and serves as an active resource center providing an array of programs and services that bring people and animals together to enrich each others' lives.